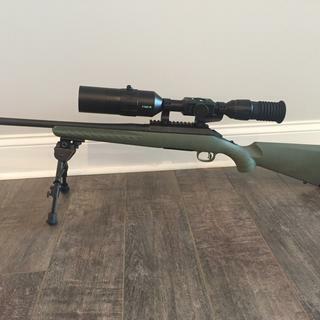 This Ruger American 308 Predator Rifle has a moss green composite stock and matte black finish. 18 inch barrel with a 4 round magazine. Deer fear this rifle. Optics ready (no sights). Good quality rifle for the price plus a solid warranty. Needed a reliable new rifle for my wife that she could use for both deer and elk. Great reviews, affordable and accurate according to very many videos I've seen. Handy deer rifle I don't have to worry about knocking around. Are 10rd AI mags compatible? BEST ANSWER: Only compatible on the model with exposed magazine release. This rifle is available in 2 versions now. Can't tell which is which from the picture but other sources are much more help than what I can provide. Easiest way is to spot the exposed mag release in front of trigger guard then you know it will work with those mags. Not as far as I know. To use a box mag it would require a chassis swap. On the rifle there is no mag catch or release lever it's all on the rotary magazine. Not for this model. This model takes the 4 round rotary mags. there is another predator model that takes ai style mags. Good hunting gun. Cheaply made mag. Hunting rifle I can put in a case and fly with and not worry about it being bumped around a bit. I like the shorter barrel for hunting as well as most shots are not that long but it seems reaching out to 300 yards fairly confidently. Reason for 4 stars is the magazine. It didnt work at all out of the box and needed full disassemble, tuning and sanding some internal parts because they caused hang ups. It still has some issues on the last round 10 percent of the time. Great rifle for a great value. The price point allowed me to spend a few extra dollars on good glass for it. Rifle was delivered promptly and was exactly as described. This Ruger is accurate and well-balanced. Recoil is noticeable, compared to similar rifles, but is expected due to less mass. This is a fine rifle, and for the price it just makes the deal sweeter. This is my go to gun now for hunting!! Great rifle especially for the price. I’ve hunted with one for years and it does the job as well or better than anything close to the price. I’m not short on other options in the safe, much more expensive or superior cool factor. This is the rifle I keep grabbing now for three seasons. And just ordered it for my son because he keeps fighting over this one when we deer hunt together. I purchased this rifle after already owning a Ruger American .270 Win. They are excellent rifles and are a great value. Ruger has a solid warranty as well. I plan to get a Magpul Hunter American stock as well as a suppressor to complete the build. Ruger American Predator with ATN X-Sight 4K Pro for night hunting. Magpul stock is next to be added. Tough to beat Ruger American when on a budget. I very seldom will give a 5 star rating and I didn't here. I've only put 20 rounds through it, and needs some scope tweaking. I have experience with another Ruger American as well as some high end rifles. Hard to beat the Americans when it comes to cost vs. value. Buy it, practice with it, and take well aimed, responsible shots at game and you'll be successful. Topped this one with a Vortex 3-9x50 using vortex's medium height rings. These are are just good overall guns, great for hunting in the woodlands and mountains of northern New York and New England. Most of my shots are 300yards or less in fields, 50-75yards in the woods. This rifle will easily do that. Great predator rifle for the price and the quality is great. Overall a good mid range rifle. this is my first 308. I am amazed I can achieve better than 1MOA at 100 yd consistently Hats off to Ruger a wonderful gun. Great gun for a great price with fast shipping. Can’t wait to shoot it. For the price point this rifle is difficult to beat. I would have given 5 stars if the rifle stock was not so flimsy. 1 MOA out of the box. Good gun, but came looking like used. This is a great little rifle and the cost is good too. But it came with stock scratched up on one side front front to back and the barrel had just sticky fingerprints all over. I don't know if I received a demo gun or a floor model from somewhere, but order was placed for a new one. So Ruger gets 5 stars, Grab a Gun gets maybe 2. Please inspect what you're packing for customers.